Where there is no vision, the people perish. Parkrun Milestones on the horizon! Landed in Hobart early, picked up the rental car – a Blue Toyota Rav4 – the colour is important because it’s not a bland, nothing colour like black, white, grey or silver (or any derivative of these colours). We headed into downtown Hobart via a detour for a cache just outside the airport, which gave me some time to look over the car and uncover where all the controls are. We stopped for pies at Banjo’s – I had a scallop pie, something that most of the guide books advise you to do – not sure if that was morning tea or early little lunch! Walked around the CBD, finding caches and getting our bearings before heading off to Mount Wellington. First stop was a cache called Jackson’s Tunnel, featuring a convict-built sandstone block-tunnel, which was part of Tasmania’s early road system. 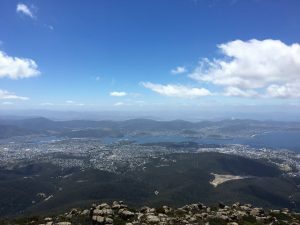 Mount Wellington is a busy place, and arguably has the best views – it’s certainly the closest, tallest mountain overlooking Hobart (which we’ve nicknamed the ‘City of Mountains’ as there are a number of them all around). 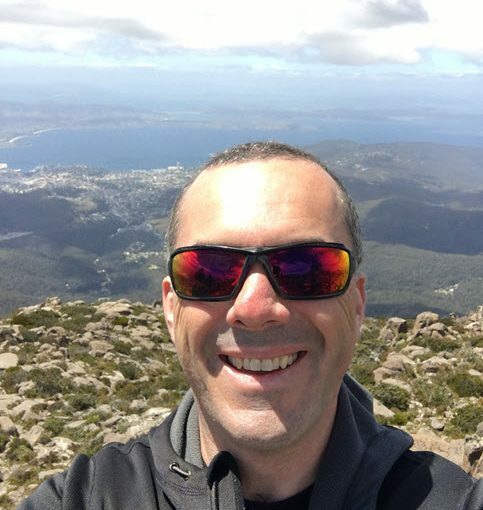 Flat space in Hobart is not easy to come by! There were quite a few people there and the weather was glorious – clear blue skies and visibility was excellent. On some days the cloud cover is so low you can’t see through it. 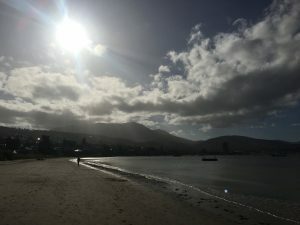 After finding accommodation and buying supplies, we headed off for a little wander around the area and went for a walk along Nutgrove Beach – watched the kite surfers as well as a brave kayaker out on the water – the wind was up and made us feel chilly! 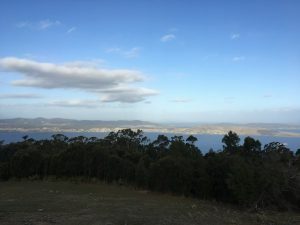 We continued our walk along the beach (finding more caches) until it ended and became residential, so we headed up to Alexandra Battery Point, with another amazing view of Hobart/the Derwent River, and wandered through the remains of the battlement that was setup here. Many of the batteries setup were never called into active use. This was one of many batteries setup to protect Hobart, from a threat that never eventuated. Onwards to Mount Nelson – up a residential, steep zig-zag of a road to visit the signal station at the top, and see what we could see. 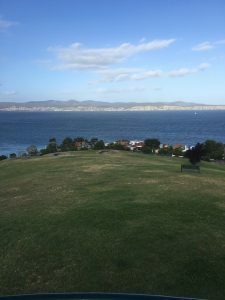 As it’s overlooking Alexandra Battery Park, the views should be somewhat similar – however, this was not the case as it turns out you can see more to the south from here than the other places, but because of the trees and bushland, you couldn’t see much of Hobart or the suburbs at all. And, the former signal station is no longer in use (when was the last time you heard of semaphore signalling?) As the sun was setting, we made our way to Mount Nelson oval for one last cache before heading to our accommodation for the night. Tomorrow, Port Arthur and interesting places along the way.